Description: This view was achieved thanks to my cousin who took me over Selkirk yard by plane. Description: CSX 7492 (ex-CR 6037) in new YN3 paint. Description: A nice mix of power on CSX Q-362-24 at Muncie. Description: Q215 with a former Conraill C40-8 rumbles through this peaceful setting a few miles north of Woodbury Ga. Description: CSX Q161-04 blasts passed the sitting consist with so called "Spirit of Conrail" in the lead! Description: A westbound manifest waiting for the light to change to head west to St. Louis. Description: A little something from the ConRail camp for a change! 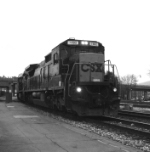 Former K940 train, an ID which existed since the late 80's until CSX upgraded our rock trains to Q700-status.